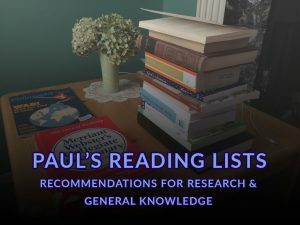 I read about many different things (my library is distributed through 4 different rooms of my house), both as research for particular projects and to expand my general knowledge. Here I’d like to share the titles of books that I have found interesting or useful on a number of different subjects. If you want to get up to speed on these topics, then, in my opinion, you could do worse than reading these selections. Explore—and enjoy!